Barack Obama travels in style – whether it be Airforce One, Marine One or ‘The Beast’; the President of the United States is well catered for when it comes to transportation. However, if I had a question about transport infrastructure, I wouldn’t ask the person who manages it for the White House. I wouldn’t have the same requirement, resources or infrastructure to make what I’m sure would be excellent advice relevant to me or the organisation I was working for. That may seem a strange thing to open a post about people with but I promise I’ll return to it. Yesterday I attended a session at #cipd11 which was all about HR & Social Media. To be honest I wasn’t going to write a post about it, the main reason being that Doug Shaw wrote two great posts (here & here) which didn’t seem to need adding to….but things moved on and here we are. The session had 2 speakers – Neil Morrison, Group HRD at Random House and Matthew Hanwell, HR Director, Community & Social Media for Nokia. Neil’s half of the session concerned how Random House have approached their employees usage of social media and how they use it as part of engaging their teams but also for engaging with authors and readers. It was an interesting session and the thing that struck me was it was very portable – to do what Random House have done you only need buy in not capex. Then came Matthew whose session was likewise very interesting and concerned how social media is now part of the way Nokia operates. How transparent communication and collaboration has developed their organisation and shared some great stuff about what they do and how they do it. However (and there had to be a however) what Matthew and Nokia have done requires significant investment both in terms of technology and resource. It requires a reengineering of internal communication and is only likely to feasible and valuable in an organisation that like Nokia is big and global. I enjoyed the session and came away with plenty to think about and have already shared some of the content with people I know who were not in attendance. Where it got interesting was in the write up published in People Management Daily (a version of People Management produced at the conference). If you were to read this article you would not know that Neil was there. There was absolutely no mention of him or his content. The article focussed purely on Matthew’s content. Given the number of big global companies and the rest I was surprised at the exclusion of ‘the first half’ because for my thinking it would be as relevant if not more so to 95% of HR Practitioners who may be trying to move their organisations towards embracing social media. Even for the big global players, trying to start the journey what Neil discussed in terms of behaviour would be incredibly relevant. Is this indicative of HR’s obsession with “shiny” when actually what delivers real organisational value for most of us is good stuff done well? To return to the original analogy what we ended up reading about was a fascinating insight into Barack Obama’s transport infrastructure when what we could have read about was the contrast between that and people who deliver results with a Toyota Avensis and a Premium Economy seat on Virgin…. The last time I was at an exhibition similar to this (#CIPD11) was about 2 years ago. At the time my badge had a nice weighty corporate job title which started with ‘Head of’ and left those reading it with the (correct) impression that I lead a function within a significant organisation and more importantly to them had budget and some discretion. As interesting as this may be to some people (and to all 4 of you I am grateful) to those who seek a signature of the line which is dotted I am a lost cause…..for the moment. Well to be honest, they get the ‘lost cause’ bit but aren’t neccessarily on to the ‘for the moment’ bit. With a fair wind and some luck at some point soon I hope to land another job which gives me a nice weightly job title and some budget to spend (I do like spending organisational cash). There have been some enlightened folks about the place today who have asked enough questions to understand that ‘blogger blogger’ may be my badge, it hides a person who could be of interest to their business in the short to medium term. However, there have been a fair few who seeing the ‘blogger blogger’ badge have in true pre-Samaritan fashion ‘crossed to other side’ to avoid what is in their eyes a conversation that holds no value. 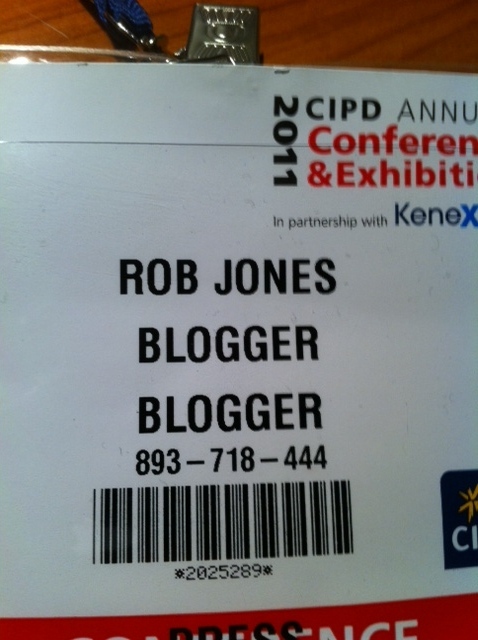 If you read this blog or follow me on Twitter you will I’m sure be aware that I am at the CIPD annual conference in Manchester. It’s the first time for some time that I’ve been to this event and like many who’ve been on hiatus I’m suprised by how much quieter it is both in terms of exhibitors and visitors. Neil Morrison wrote a post at the end of day 1 making the self same point and whilst not wanting to rehash his post, I have reflected on it and some of my own experiences so want to share what I believe would be a good next step in conference evolution. I should say at this point that I don’t think is an issue facing just the CIPD, I think it’s a challenge to conference organisers everywhere. Neil makes the comment “Some will argue that the unconference format is the way forward, but I’m really not that convinced”, I am not wholly convinced on the idea of pure unconference (if you don’t know what I mean read this) but my belief is that the next step is what you could call conference/unconference. 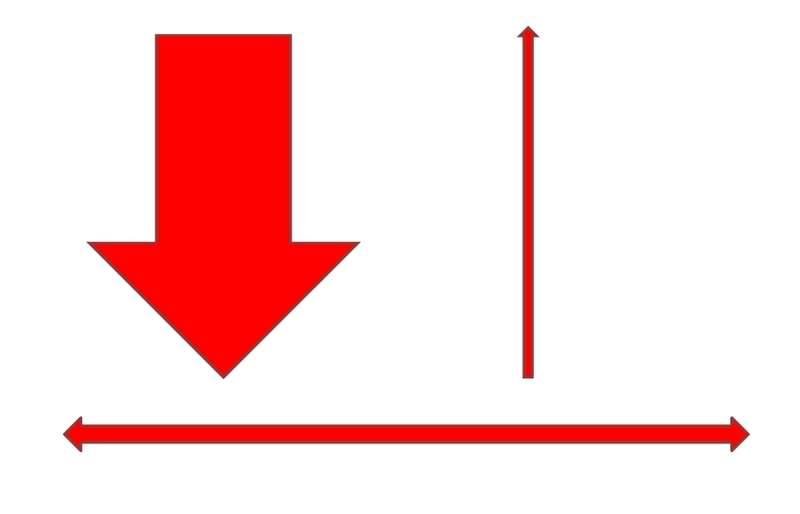 The conference keynotes and conference sessions are the big down “broadcast” arrow, the horizontal arrow represents the inter-delegate conversation (larger that it would have been thanks to things such as Twitter) but the up arrow remains small – the only real “up” being the brief Q&A sessions that are always a rush as the session draws to a close. Personally, I like some broadcast. I like hearing what other people are doing. I like hearing what other people have made work and landed in their organisations. That may be just be me…. I think the idea of using that broadcast mechanism to stimulate debate and interaction in an unconference format (more free form and drive by the participants) would be far more productive for attendees and also allow the presenters (broadcasters) to get some meaningful feedback on their work. Also, some (limited) case study does make it easier when influencing internally in my experience – an idea endorsed with “big shiny company X does this” tends to get more traction than “we came up with an idea on a fag pack at a conference”. Neil also makes the point, “With a three-day ticket costing over £1000 people will think twice about the value an event like this can give them compared to other uses for limited funds.” I agree with him in that a) it’s a lot of money and b) it’s a difficult time. My thinking (and here’s where it may sound a bit hairbrained) is that you need to make the cost of attendance minimal (administration only). I realise that the conference is a major revenue stream for the CIPD (and others like them) BUT I am not suggesting kissing off the revenue…. Imagine you increased the number (and quality) of the visitors by 10. Firstly, your conference/unconference sessions would be buzzing, the venue would be alive with energy and most importantly (and this is where it could make sense) the exhibition hall would be awash with visitors and the stands would be overflowing. Your exhibitors would be buzzing and both the number of exhibitors and the prices you could justifiable charge them would increase. Now I understand the quality piece may be tricky. That would require some strategic inviting and ensuring the “Who’s Who” of HR were here, which would mean that it would be THE PLACE to come, network and meet the people who are moving and shaking at the top of our profession. I was just about to press publish and realised that I am here as a guest of the CIPD and this post may feel like biting the hands that feeds etc but this is NOT a criticism of the operation or organisation of a massive event. This is a desire to see an increase in sharing, improvement and networking which can only develop our profession. So there you have it….my solution to all conference woes. What next? Was going to work on the solution to the eurozone crisis but it’s time for a beer so that’ll have to wait! So yesterday morning Sir Terry Leahy keynoted at CIPD Conference in Manchester. All the cliches that are often applied are not actually cliches for this man – he was a captain of British industry and his leadership saw a business go from “also ran” to “King of the Castle”. My intention here is not to tell you what he said as Doug Shaw did an excellent job of that in this post but to share some reflections of watching one of the most successful business leaders in a generation hold court and follow up on a post I wrote a few days ago which posed a question. In an industry that has featured the full effect of Sir Stuart Rose, the polished delivery of Justin King and the tour de force that is Sir Phillip Green, Leahy was always the also ran when it came to showman ship and charisma. His appearances were very structured, his press photos always in front of a store and until yesterday I couldn’t have told you what he sounded like. It was therefore quite a surprise to me that to hear someone who was relaxed, not charismatic but engaging and still true to his Liverpool roots (although with a little city polish). The man who stood in front of me had the calm self assurance of someone who is not talking about possibilities, but has delivered results. He goes to sleep at night knowing the impact he had, the shareholder value he returned and the world which now rests at his feet. What he had to say was relatively interesting. He made some comments about the business that I know some in the room would question but painted a pragmatic picture of operating a growing FTSE100 business. The acknowledgement that was lacking for me was the assertive, possibly aggressive, stance that Tesco take commercially. Having worked for both a Tesco supplier and latterly a company that competed with some categories at Tesco, you may be forgiven for thinking the description given today was of a benevolent responsible organisation when in fact it may be both those things but it’s an organisation that takes no commercial prisoners and neither should it. Some, including Doug in the post linked above, question the dominant position Tesco have achieved in the UK and in some markets overseas. If there is concern there I don’t levy it at Leahy and his team – if Tesco is out of control it’s the fault of regulation and legislation, not of an organisation that is inherently there to return share holder value. In thinking about us all sitting there listening to him it almost felt like a lion addressing a room full of wildebeest . Not for a moment was anyone from the room going to ask a question that didn’t play to him returning an answer that comfortably allowed him to continue to referring to Tesco as “we” (he left the organisation in the Spring of this year). No one, myself included, moxied up the neccessary guts to ask the question I was hoping that someone was going to ask…how did he think Tesco’s current performance reflected on his legacy? Did this challenge him as Level 5 Terry (in Good to Great speak) and render him a mere Level 4 (despite the awe inpsiring growth in market capitalisation). In a conversation with Philippa Lamb (who had interviewed him for this session) I raised the question I was hoping someone would ask and acknowledged there was no way she could have asked it, but I am disappointed that no one person in the room asked the question that HR professionals should be asking rather than a nice stream of interesting questions that played to Sir Terry’s tried and tested responses. The elephant remained on the table, the lion left for a meeting in Milan and the wildebeest all shuffled off for a coffee and to muse over how many Tesco Clubcard points they had. I have an interesting week ahead. Largely on the back of this blog I have been invited by the generous folks of the CIPD to be at their annual conference and exhibition. Since the invite is blog related I have a journalist pass and can effectively join any session I want…. The downside of this for you gentle folk is likely to be a rush of posts this week so please consider this your due warning. I last went to this event in either 2002 or 2003 with my then boss and aside from him, I knew no one else there. This time it’s VERY different, due largely to Twitter I know quite a few people going and through various conferences and meet ups in pubs, they are not just avatars but fully rounded (in some cases!) people who it will be good to catch up with. That said there are a few people going who are still just avatars so putting people to pictures will be good. I went to several parties whilst there (thanks mainly to the fabulous client service director at our recruitment advertising agency) and for the most part they were hosted and paid for by the print media. Telegraph, Guardian, Sunday Times and Personnel Today. I think the online guys were there but they were definitely the side show and not throwing money around (well not at a bar in my vicinity). I think this time it’ll be different! The opening keynote on my last visit was Jim Collins, author of “Good to Great”. I had never heard of either him or the book previous to hearing him speak. I came away enthused and read the book. I filed it in the “some great ideas as part of the mix” a view I still hold. But the idea that really stuck with me was Level 5 leaders and how, amongst other things, they ensure succession and the business continues to be successful once they have departed. For the record I believe that Tesco is an incredible business. I don’t feel any resonance with the brand and it’s not my choice of shopping experience but I think what they have achieved is astounding. Whether they should have been allowed to achieve it and the impact they have is a whole other kettle of fish but I am very interested to hear what he has to say considering under this leadership HR apparently went back to personnel in both name and operation and did not sit on the executive. Anyway enough of this….I’m off to find the 7 chargers I seem to need any time I leave the house these days. If you’ve just got ‘a week’ then good luck with that, if you’re going to #cipd11 then see you in Manchester!